The world will be denied the 39th encounter between Rafael Nadal and Roger Federer in the Indian Wells semifinals after Nadal withdrew Saturday afternoon following a knee injury sustained during his quarterfinal win on Friday. Federer, 37, advanced via walkover and will face Dominic Thiem in Sunday’s final after Thiem beat Milos Raonic in three tough sets. 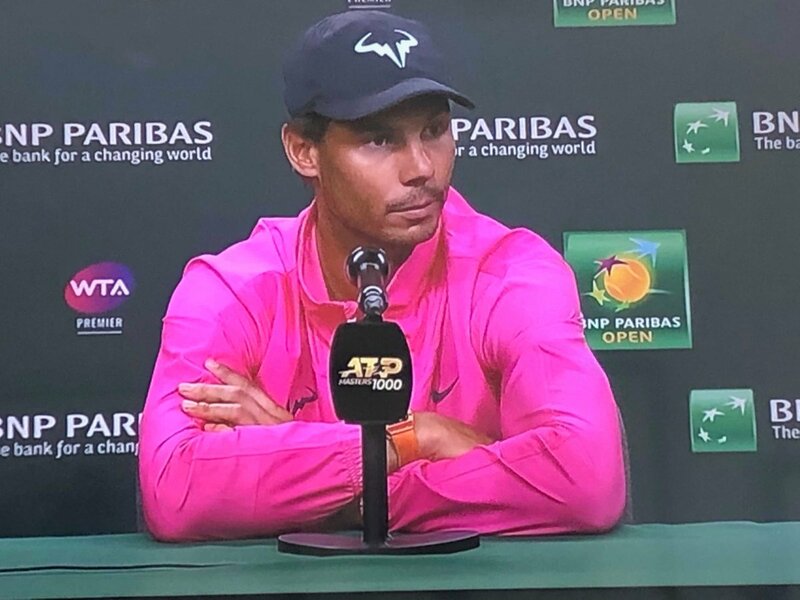 “I wanted to try my best to be competitive today but I went out today the morning and I felt that my knee was not enough to compete at the level that I need to compete in the semifinals of this event,” Nadal said. Nadal leads Federer 23-15 all-time but Federer has won the last five. Nadal has not beaten Federer since the 2014 Australian Open semifinals. Nadal, who turns 33 in June, had won Indian Wells three times. In recent years he has had trouble finishing hardcourt events. Including last year’s US Open, he had had failed to complete all but one of the 16 hardcourt events he entered. The 17-time Grand Slam champ said he will skip the upcoming Miami Open on hard courts but won’t stop playing those events completely. Federer skipped the clay court season the last two years to manage his schedule and prepare for Wimbledon. This year, however, he plans to return to the clay. Now we may see Nadal adjusting his schedule to limit his hardcourt events. “This is a situation that we were not expecting, so now we need to adjust a litte bit all the calendar,” he said.